1. 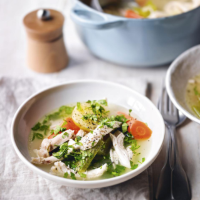 Place the whole chicken in a large stock pot and cover with 4 litres of cold water. 2. Add the carrots, onions, celery and garlic, then the peppercorns, star anise and bay leaves. 3. Bring the pot gently to a simmer and cook for 1½ hours until the chicken is cooked through with no pink meat and is falling apart. Leave to cool slightly before lifting the chicken out and setting it aside in a bowl ready for picking. 4. Strain the stock into a clean pan. Add the barley, carrots, parsnips, celery and potatoes. Place back on the heat and simmer for 40 minutes until the barley is tender. 5. Meanwhile, remove the flesh from the chicken, discarding the skin and bones and ensuring all the tiny bones have been removed. 6. When the barley and vegetables are tender, add in the cooked chicken, pulling it into pieces as you go with your fingers. Stir in the chopped parsley and serve with buttered bread.